Description: Outstanding horse property on 5 irrigated acres. Cathedral ceilings, clear story windows and skylights add lots of beautiful light to this home. Gas log fp + cozy wood stove. Mbr has big walk-in closet, sep. Shower, jetted tub, dbl sinks. Spacious kitchen w/granite counters, cooktop, island, breakfast bar & pantry. Brs 3&4 used as office/study (lack closets). Great horse facilities with 5 stall barn, arena, pasture, round pen, extra 2-stall barn. Irrigation from concrete ditches. Two irrigation wells. 3-car finished and insulated garage. 12x20 storage shed. And 8x10 movable shed. Surrounded by irrigated pasture, you have the privacy, peace and quiet of country living. 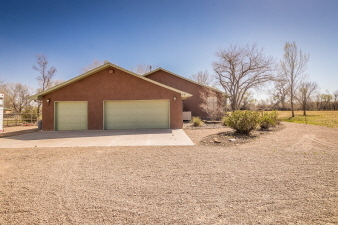 Hurry to see this unique true valencia county gem!